Four Seasons at Wayne is an intimate 55+ community located in Wayne, New Jersey. Situated close to many major roadways, residents enjoy a quick drive to entertainment, shopping and dining nearby. New York is also only 45-minutes away and offers an abundance of entertainment. This active adult community consists of 230 low-maintenance condos built by K. Hovnanian between 1999 and 2001. Homeowners throughout Four Seasons at Wayne enjoy a hassle-free lifestyle that offers residents more time to enjoy the recreation and activities found throughout Passaic County. The community amenities begin at Four Seasons at Wayne’s clubhouse. This facility provides all of the amenities that enhance an active lifestyle. Here residents can gather for a game of cards or billiards, work out in the fitness center or attend a community party in the large gathering room. Outdoors, residents can take a dip in the pool, lounge poolside, play bocce ball or challenge a friend to a tennis match. There are even walking and biking trails throughout the community as well as a gazebo. K. Hovnanian developed Four Seasons at Wayne from 1999 to 2001. There are 230 condominium units in 14 buildings. There are first and second-floor units with elevator access. Most homes feature two bedrooms and two bathrooms. These thoughtfully designed homes feature nine-foot ceilings and spacious layouts, which make them feel very open. Each homeowner also has two parking spots in an enclosed garage. Four Seasons at Wayne welcomes active adult homebuyers aged 55 and better. Because the homeowners’ association fee covers snow removal and exterior maintenance, residents can live worry-free, active lifestyles. With an intimate community setting, residents of Four Seasons at Wayne are very active and have a busy social calendar. Residents can gather with neighbors to plan parties, enjoy the company of friends in a game of cards or join in outdoor activities with like-minded residents. 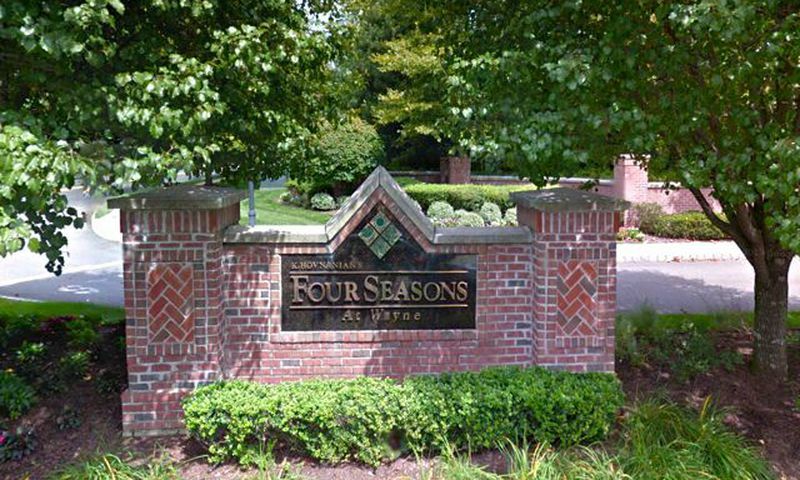 Four Seasons at Wayne is located in Passaic County, New Jersey just off Patterson Hamburg Turnpike. The community’s close proximity to major roadways, including Interstate 287 and Interstate 80, makes visits to New York an easy 45-minute drive away. Philadelphia, Atlantic City and Seaside Heights are also about two hours away. Nearby homeowners are close to shopping, restaurants, medical facilities and places of worship. The Fashion Center, Westfield Garden State Plaza, and Paramus Park Mall are only a short drive away and offer a variety of shops for all of your shopping needs. Popular attractions in the area include the Turtle Back Zoo, Saddle River County Park, Sportsworld Amusement Park, New Jersey Children’s Museum, Newark Museum, and Morris Museum. Sport enthusiasts love to attend a New Jersey Nets or Devils game as well as a New York Giants game. This Passaic County community is close to everything to stay active and entertained throughout the Northern New Jersey area. Check back soon for more information on the lifestyle in Four Seasons at Wayne. My condo here is great. I was a little worried about being on the second floor but I do love the view. The amenities here are nice and well taken care of. I like that it's a complete community with no noisy construction going on. Some of my friends have bought in new developments and are complaining now about all the construction noise, glad I didn't make that mistake! 55places.com is not affiliated with the developer(s) or homeowners association of Four Seasons at Wayne. The information you submit is distributed to a 55places.com Partner Agent, who is a licensed real estate agent. The information regarding Four Seasons at Wayne has not been verified or approved by the developer or homeowners association. Please verify all information prior to purchasing. 55places.com is not responsible for any errors regarding the information displayed on this website.